Proudly presented by the Putney satellite group of London Independent Photography, a community organisation for amateur and professional photographers with over 600 members. Some of the pictures will be available for sale - please ask for further information. This is their second exhibition in Putney and the first time they have exhibited at The Exchange. Lesley Bruce: Lesley is a local photographer, with a particular interest in experimental photography, still life and portraiture. Ann Ulrick: is an amateur landscape photographer. A winner in the Snapshot section of a recent Wandsworth Bor’ Photo Competition & a finalist in 2011. A finalist in the Wildlife Category of the Photo Competition in the travel mag’,Flamingo. Ann has sold her work through local exhibitions incl’ Putney Arts Theatre. Karen Dixon: studied art at uni & has been interested in photography since she played with her grandfather's cameras as a child. She studied at The Putney School of Art & Design & began focussing on digital photography about 4 yrs ago. She is currently exploring Photo Impressionism, which which uses in-camera photographic techniques to produce images with an impressionistic feel. Pelin Karakas: is an amateur photographer since childhood, especially fascinated with travel & street photography & everything about people. She moves internationally due to work, so constantly feels travelling even when at home & currently discovering London, her new home, through photography. Amir Azimi: I'm an enthusiast photographer. Street photography and aviation are my most favoured fields and I also enjoy travelling. As a journalist, I try to tell a story in my photos. Sara Rackow: A teacher for children with special needs for 20 yrs & has written a book on autism.She first became interested in photography 30 years ago having borrowed a second hand SLR from a neighbour. She has been taking photographs locally ever since.Recently retired,Sara began writing, travelling & taking photgraphs around the world. 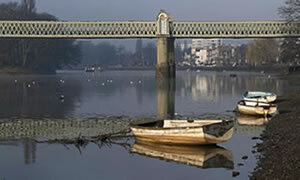 Katie Sneary: I joined the Putney branch of London Independent Photography on its inception. We have a monthly project, which I find interesting and challenging. It has made me look at photography and nature in a new light. Zeenya Wahab: Having only ventured into the DSLR world fairly recently, it has now become a permanent accessory on every outing! I’m constantly learning but enjoying the challenge. I snap at anything that catches my eye and gives me inspiration. Justin Welch: Is a semi-professional photographer based in East Sheen. His photographic style is influenced by various techniques, technologies and his own artistic interpretation of the world we live in. He does not specialize in just onearea of photography; his work incl’s Fashion, Beauty, Portraiture, Travel, Urban, Abstract, Wildlife and Fine Art. Andrew Wilson: studied photography at Putney School of Art & Design before publishing his first book Wild in the City in 2009.He has since published books under the Wild banner incl: Wild about Putney & is working on another three. Photographically, he has a fondness for nature in an urban environment.